Your own bath tub. In most cases only the bigger, garden tubs are big enough for the birth. The photo just shows one kind. Oval is fine. The deeper the better. Pros You don't have to buy it or blow it up. You won't need the hose or bucket. Clean up is easy. Cold or dirty water can be let out or replaced easily. Cons Often the bathroom is really small and hard to hold birth attendants. Usually, the tub has walls on three sides limiting access to the mom for support and massage. Some tubs are not quite deep enough to allow you to give birth in any position but sitting. The bottom and sides are hard and can be uncomfortable, though towels can help with that. There may not be room for Dad if he wants to be in the water. The Fishy Pool It isn't really called that so don't go into a store asking for it, but all the midwives I know call it that. It is a child's swimming pool, hence the cartoon fish. 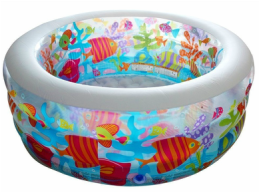 It is so popular as a birth pool that all the comments on Amazon are about that. Some people have found them at Target or Walmart. Just try for the 60" x 22" size. Pros It is fairly inexpensive, but prices vary widely; $25 to $65. 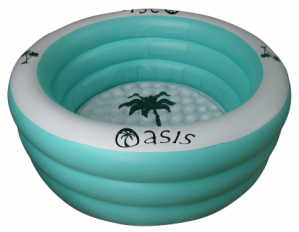 The blow up sides and bottom are pretty comfortable to sit on. It is accessible on all sides by attendants. It can be in any room to allow for more people. It could be cleaned up and reused as a kiddie pool. Usually, the Dad can fit in. Cons It must be purchased and blown up prior to the birth. It must be filled with a hose and cold water will have to be removed with a bucket during the birth. It must be emptied and cleaned or disposed of after the birth. 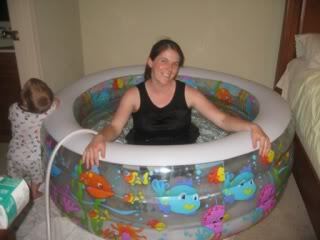 Midwives prefer the 60" x 22" pool because the bigger one 72" x 25" makes it too hard to reach the mom and hard to have enough hot water to fill. Inflatable Birth Pool There are several kinds of these with different features. This is a comparison of pools showing some of them. Prices vary. One has a lid, one is phalate free plastic. All have liners. Shop around of course, but YourWaterBirth.com has good prices, and use the code bmiller for 10% off. Pros They are designed for birth and tend to have firmer sides than the fishy pool, cushioned bottoms, and are a couple of inches deeper. They will fit easily in most rooms and are accessible on all sides by the birth attendants. Though they say they are designed for single use, they can be used many times. 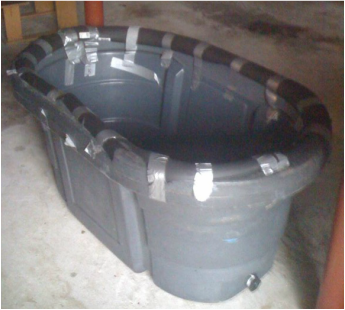 The fitted liner keeps the pool itself clean. You could easily sell it or share in purchasing with other moms in this practice. Cons They are quite pricey, from $120 to $250 before shipping. Again, they must be filled with a hose and cold or dirty water removed with a bucket. Our Horse Trough This is a lightweight, plastic, watering trough for livestock. Pros This is free to use if its is available (no one else has reserved it). It is small, better for space limited situations. It is very deep and covers the belly nicely. The hard sides make it easy to support yourself while squatting or kneeling. There are foam pads on the edges to make it more comfortable to lean on. Since we require you to line it with plastic, you could put pillows in the bottom. It is accessible on all sides by birth attendants and can be set up in any room. Cons It is not big enough for two people. It has to be filled and drained with a hose. You must use a bucket to take out cold or dirty water. The Aqua Doula is a pool that you rent. It is electrically heated. My feeling is that these pools are obsolete these days. The other pools stay plenty hot, and it isn't really a big deal to swap out some water if needed. I have attended births where the Aqua Doula pool was too hot and we were swapping out water anyway. The other issue was that they were rented for a limited time, and some moms had to give it back before their babies were born. I found this source but I don't know them.